Owning the best saute pan will help to elevate your cooking skills and final dishes. A sauté pan can easily be confused with a skillet or frying pan simply because people do not know the difference or when to use each pan retrospectively. A sauté pan has a larger surface area for cooking and generally has side that is vertical and even all the way around, allowing you to place a lid on the pan. While a skillet has sides that flare out and are much shallower. Yes, they both serve some of the same cooking functions, but while a skillet can do some of these things, the sauté pan can do all of them based on its size and construction. However, there are some electric skillets that claim to be able to do most of the capabilities of a sauté pan because their shape and design are very similar. So there is a number of differences and similarities of sauté pans and frying pans. Sauté pans are great for making whole meals using this pan only. The sauté pan will most likely be able to be placed in the oven, doubling its function as a baking dish. There are many different methods and techniques to be utilized while using a sauté pan that most other pans just can’t handle. There are also several differences between some models of sauté pans as well. Not just any sauté pan will do the job of another. In this article, we will go over what to look for when purchasing a new sauté pan as well as the best type of construction and design that will best suit your needs. We will also cover some of the models of sauté pans that are currently available for purchase today. You will want to make the sauté pan will be one of the last pans you will ever have to buy. So, you will want to make sure it is well constructed of high-quality materials and has some kind of warranty attached to it. There several different kinds of sauté pans but they can be summed up pretty much into 3 categories. Stainless steel, cast iron and non-stick or Teflon coated. Each of these pans serves different purposes from each other. You could own all three types to make sure you are prepared for any cooking scenario or you could determine what you need in a sauté pan and go with the best decision. Non-stick sauté pans are the easiest to use as long as you are able to take care of them properly. They are usually lighter and are coated with Teflon to prevent any sticking at any time. Usually, these pans cannot be placed in the oven and must be washed by hand, not in the dishwasher. You will also need to use only wooden or rubber utensils when cooking in this pan. The metal utensils will scratch the Teflon coating off. A stainless-steel sauté pan is a very versatile pan to have and is used in most professional kitchens as well. The pan is heavy and is able to be placed in the oven and in most cases the dishwasher as well. However, the pan is very heavy and does not have a nonstick coating. The cast iron pan is also a great choice because it is the cheapest of all the options and is incredibly versatile. This pan can go in the oven and is non-stick as well. However, it is very heavy and is not dishwasher safe. Cast Iron pans need to be hand cleaned and re-seasoned to be able to last forever. The construction of the sauté pan is very important because it needs to serve several purposes of other pans all at once such as a wok, skillet, saucepan, baking dish and others. The size of the pan will also make a huge difference with different cooking methods. The most common sizes are 12-14-inch sauté pans. There are other sizes available, but for an overall, one use sauté pan, this is what to go with. The sauté pan also has to have the same design as a saucepan with the higher walls. The other “sauté pans” which are actually skillets have walls that protrude out and up sort of like a wok. Most are made of quality materials that are heavy iron-clad with steel coatings or all cast iron for that matter. There are some that have copper bottoms to help create even cooking surface over the whole pot so everything cooks evenly. This copper bottom does not work on an induction cooktop burner though as it is not compatible. If you have an induction burner, make sure to have a compatible sauté pan as well. Some of the models also have lids which are great to have to avoid any mess by containment. However, make sure the lid is safe to be placed in the oven as well. Not all the lids are metal and most are made of glass, so be sure the lid can withstand that kind of heat before using in the oven. A warranty will help to protect your sauté pan when it breaks. Most quality manufacturers offer a lifetime warranty with their products because they are confident it will last forever. If the product does not come with some sort of guarantee or warranty then it is pretty clear that is a red flag and should not be considered as a reliable product that will outlast the test of time. Our first sauté pan is a high-quality product, hence why the price is almost $200. While it is very expensive, it does not come with any warranty to protect it from defects or damages that may occur while in use. 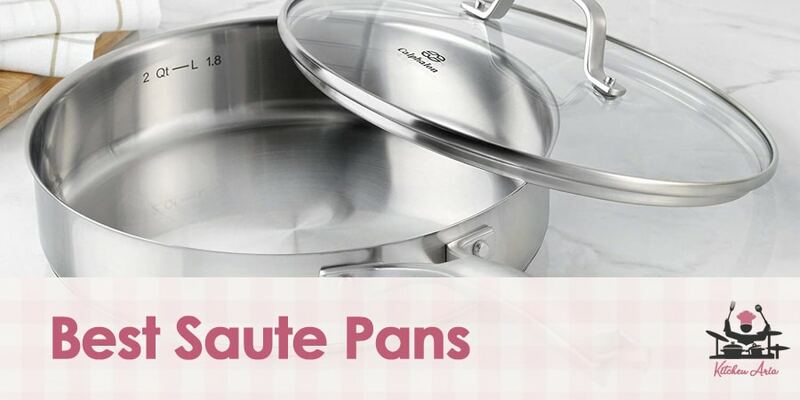 The pan is well constructed of high quality 18/10 stainless steel which is proclaimed to be stick resistant, but in all reality is not at all. The inner structure is combined with iron clad to create an even temperature across the surface of the pan. This sauté pan will also work in any induction cooktop burner. The sauté pan comes equipped with a stainless-steel lid as well. With the entire pan and lid being metal, this means it can be placed in an oven or a dishwasher safely. This will widen the number of techniques and methods that can be used while cooking with the pan. This is going to be the best option for a non-stick sauté pan. This pan is also a fraction of the price of the previous pan with a lot of the same qualities. The pan is constructed of cast stainless steel with a Teflon coating on the bottom surface of the pan. This means nothing will stick to the pan without grease or oil. The pan is also set apart from most other non-stick sauté pans because it can be placed in the oven of temperatures up to 450 degrees. The sauté pan also comes with a tempered glass lid to prevent any splatter or spitting while cooking. The handles are also oven safe and will stay cool while working the pan on the stove top. The sauté pan is equipped with a tempered glass lid to prevent messes and the handles are not only oven safe but will also stay cool while cooking on the stove. The pan is constructed of high-quality cast stainless steel and coated with Teflon to ensure nothing will stick to the pan while cooking. The sauté pan is also oven safe up to 450 degrees. There is no warranty to protect the product from defects or damages that may occur while in use. The lid is not oven safe. The pan is not dishwasher safe. This pan is almost identical to the first pan we reviewed in almost every way except for a couple, which is why it comes in at number 2 for stainless steel pans. The pans have all the same features except for this model is half the price of the other and also comes with a lifetime warranty to protect it from any damages or defects that may occur while in use. However, this pan is much heavier and not made of the highest quality materials as the other. The other one is also 2 quarts larger in size and capable of doing much more cooking techniques and methods. Comes with a lid that is metal so it can be placed in the oven safely. The pan is dishwasher safe but is recommended to be handwashed. The sauté pan comes with a lifetime warranty to protect it from any defects or damages that may occur while in use. The pan may be very heavy and hard to maneuver at times. This pan is also almost the exact same pan as the last one we reviewed. All the same stats and functions but with just one or two differences. The pan is constructed of quality materials like the others, but this sauté pan is only 2 ply iron clad while the others are 3 play iron clad construction on the bottom and walls of the pan. Plus, there is no warranty to protect it from any defects or damages that may occur while in use. The pan is cheaper than the other two we have reviewed and is also the largest size with the ability to cook up to 5 quarts. Everything is dishwasher safe and oven safe with little to no problems. A great buy for any home owner. Comes with the largest surface areas and containment of any sauté pan on the market. The pan is constructed of only 2 ply iron clad rather than 3-ply like most other pans. There is no warranty to protect the pan from damages or defects that may occur while in use. This next sauté pan may seem like a great pan with all its self-proclaimed features but is actually a wolf in sheep’s clothing. The pan is quite expensive and says it can do more than the average non-stick pan but we beg to differ. The pan is very large being able to hold 5 quarts and is coated in a non-stick Teflon coating to prevent food from sticking during the cooking process. The pan also comes with a tempered glass lid but it is not oven safe. The pan is supposed to be oven safe up to 400 degrees, but the Teflon may scrape off and the synthetic rubber handles may not hold up to the heat. While the pan is quite expensive, it does not come with any warranty to protect it from damages or defects that may occur while in use. The sauté pan is very large being able to hold up to 5 quarts. The pan is coated with Teflon to prevent any sticking during the cooking process. The pan comes equipped with a glass lid to contain the contents and has synthetic rubber handles for comfort. The pan is not dishwasher safe and cannot be placed in the oven at high temperatures. The pan does not come with a warranty to protect it from damages or defects that may occur while in use. This sauté pan is actually very affordable and may be just the right fit for you and your kitchen. The pan is quite larger than the others coming in at 5 ½ quarts size. The pan is made from 2 ply cast stainless steel and also is equipped with a steel lid. The pan and lid are also dishwasher safe and also may both be placed in the oven together. The stylish and shiny sauté pan may seem like the best choice considering it is so cheap but also because it comes with a lifetime warranty to protect it from any damages or defects that may occur while in use. Very affordable pan that comes with a lifetime warranty to protect it from any damages or defects that may occur while in use. The pan is very large at 5 ½ quarts and also is equipped with a stainless-steel lid to prevent messes. The pan and lid are both dishwasher safe and may both be place in the oven together. The pan is only made of 2 ply cast stainless steel instead of 3 ply which does make it lighter but also less durable and less even heat distribution. This is also a great deal on an all stainless-steel sauté pan and happens to be a little bit cheaper than the last one. It also has a warranty to protect it but this one only has a 10-year warranty instead of a lifetime warranty like the last one. The pan has the same construction and same features as the last pan except for one detail. The lid is made of tempered glass instead of stainless steel, which means is may be dishwasher safe but is not suitable to be placed in the oven at high temperatures. Very affordable pan that comes with a 10-year warranty to protect it from any damages or defects that may occur while in use. The pan and lid are both dishwasher safe and the pan may be placed in the oven. The lid is not suitable to be placed in the oven at high temperatures. The last sauté pan on our list comes from a well-known chef who makes all of his pans with a copper coated bottom to help evenly distribute the heat across the surface area. The pan is well constructed of 2 ply cast steel and coated in non-stick Teflon to prevent sticking during the cooking process. The pan comes with a heat tempered lid and is dishwasher safe and oven safe up to 350 degrees. The pan does come with a limited warranty but only against any defects from shipping, good thing the pan is very affordable. Very affordable pan that comes with a limited warranty to protect it from any defects that may occur during shipping. There is no warranty to protect it from any damages that may occur while in use. Whatever sauté pan you decide to go with at least make sure it is reliable. Make sure you are comfortable using the product as well. There is no point in buying something you don’t know how to use or are unable to use. Make sure that if you own an induction cooktop, the sauté pan is also compatible with the burners. If not, you will want to make sure the pan is made of quality materials and constructed properly to ensure the durability and strength of the pan. Now, go out and get yourself the best sauté pan money can buy and get cooking!